As you read this we will be three rounds into the club championship - to be concluded Tuesday 12th. As I write this, however, it's an hour and a half or so before the whole event kicks off so I have no idea yet what's happened. An update will appear as soon as we have it. In the meantime, total lack of modesty forbids me not putting up my favourite finish for quite some time. It's one of those where you might be able to guess what the winning move is just because it's a position where you're told there is one. It's the proving it without moving the pieces around that's the tricky part. Well for me it is anyway - although this time I managed it. Robin Haldane leads on 3/3. ... Rxf2 is indeed the move ... and the follow up? I'm quite curious to know how deeply you calculated it Jonathan ---- I only got so far before the computer had to show me the most accurate moves. 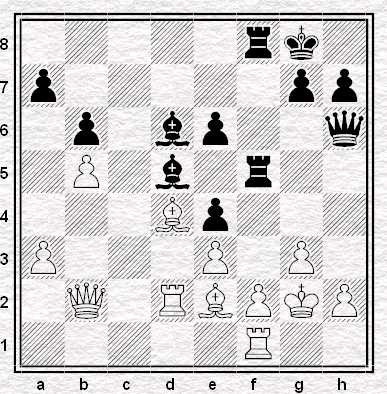 I'd seen the end position from the start (in fact the move before the start as I'd seen with my last move - ... Raf8 - set up the threat and that his last move - Kg2 - did not prevent it) although it's not the most accurate sequence as it turns out but even with White's best play it's plenty enough to win. I'd seen that I'd have at least a draw if he played this and could work out if ... Bxg3 was good for Black when I got there. In fact it is - my opponent demonstrated the forced mate as we looked at it straight after the game. DR: it goes (something like)... Indeed this is why Black wins - although otb you can't get risk "something like" actually working out you have to know. The tricky bit was seeing in advance that 4. ... Qg1 wins rather than Black playing either of the tempting captures on g3 (which do not). A better player than I may just be able to judge that their 'must' be something there for Black without having to see it in advance but I certainly couldn't. Of course calculating all this for me quite lengthy variation is helped by the fact that it's all checks until the last one. Doubtless yet another Dutch Defence. A nice finish like that will keep one playing the opening well past the grades where it still earns points. As Bozo used to annotate: "Grrr." Doubtless yet another Dutch DefenceWell spotted O-CP. I'll be coming back to my new favourite opening on Friday. Will it bloom this year?